Accessible toilets are located throughout our T1 International and T2 Domestic terminals. View or download our terminal maps to view their locations. Assistance animal toilet and watering facilities are available at the T1 International terminal after security on the arrivals level. All ATMs throughout T1 International and T2 Domestic terminals have braille functionality. Changing places bathrooms provide full sizes change tables and hoists to meet the needs of people with profound disabilities to provide facilities to use amenities more comfortably. More information on the Changing Places project can be found here. Wheelchair accessible drinking fountains are located throughout our terminals. There are a number of Flight Information Display screens throughout our T1 International and T2 Domestic terminals. Refer to the screens for up-to-date arrival and departure times, boarding calls, gate numbers and baggage carousel details. T1 International terminal is now a quiet terminal, meaning passenger and flight announcements are confined to gate areas only. Essential announcements will continue to be made throughout the terminal. You can also check the status of your flight through the Sydney Airport website and get live status updates through our @flySYD Facebook and Twitter pages. As part of Sydney Airport’s commitment to comply with the Disability Standards for Accessible Public Transport (DSAPT), the installation of hearing loops is now complete in select areas of T1 International terminal and T2 Domestic terminal. 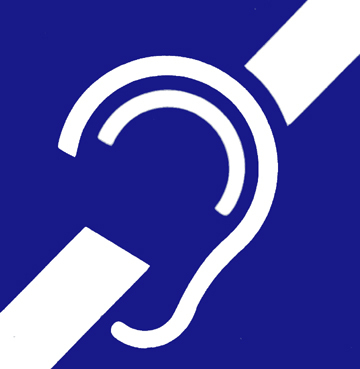 Look for the International Symbol below, which is used to indicate that a hearing loop has been installed. More information about hearing loops can be found here. If you are deaf, or have a hearing or speech impairment, you can contact Sydney Airport via the National Relay Service. Provide the NRS with the Sydney Airport Customer Care number, 133 793. There are interactive information and wayfinding kiosks located throughout both T1 International and T2 Domestic terminals. These have been designed to assist people in wheelchairs at various locations. Luggage trolleys are available on both the Departures and Arrivals levels of all terminals, and our trolley bays accept credit cards, gold coins or notes ($5, $10 and $20 notes only). Public telephones can be found throughout all terminals. All public telephones are hearing aid compatible and have the ability to send SMS. Access within the terminal is facilitated by the provision of aerobridges, ramps, travellators and lifts. Tactile ground surface indicators are also used within the terminal to provide people who are visually impaired, indication of changes of surface conditions. Various ground transport options available for all passengers departing from all of our terminals including: bus, train, shuttle, taxi, ride share operators such as Uber and UberAssist, rental cars, limousines, self-drive and bikes. A dedicated special assistance lane is available at all kerbside taxi queue ranks. Two accessible pick up spaces are available on the Arrivals level of all terminals with wheelchair access ramps. Drivers must remain with their vehicle at all times. Wheelchairs are available upon request from your airline. Please advise them of any requirements at the time of booking and at least 48 hours prior to your arrival to the terminals.